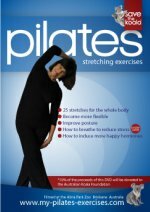 Pilates DVD Workout: These videos have been filmed at the beautiful Sunshine Coast in Australia. It is an area of great beauty and beautiful people. It is here where I have the good fortune to live and enjoy. It is also here where I teach my pilates mat classes for people over the age of 50. 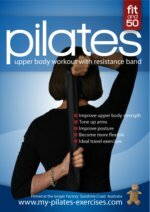 ***(Please consider working out at home, & know that we have a wonderful range of Pilates DVD's which we can post to you, for only $20 guaranteed delivery. How to be more flexible..
How to strengthen your muscles..
How to improve Balance & Posture..
How to fix your back problems..
How to strengthen your Pelvic Floor.. The benefits that you will enjoy include increased flexibility, a strong core, better balance and posture, stronger back muscles and a generally well-toned body. The DVD will give you a good overall workout. Generally speaking, you'll feel a whole lot better in your level of fitness and confidence. Click here to BUY NOW ($20 US). “The Pilates classes really surprised me. We started with some limbering up, followed by a number of floor exercises... it made me think of the calisthenics I did as a kid. Within a few months my body was changing. My chiropractor assured me that my lower back was more stable. I could turn my neck more easily when driving. Another benefit - safer driving..
Can you touch your toes? Can you get up from sitting on the floor? The benefits of this DVD is focused on your flexibility. Your pain, which of course is often caused by tight muscles, will be diminished. We stretch all major muscles groups. You'll feel the difference almost immediately. You'll will again walk tall in a pain-free body. Yea! The benefits here of using a theraband focuses on strengthening and stretching your upper body, back and core muscles. If you are concerned about your posture, (which starts to suffer when we're over 50! ),it will certainly help improve it. This DVD will tone and stretch as you re-shape your body. 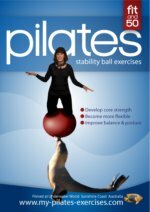 It's easy to kneel on the stable floor, but when you do it on the ball, you're using dozens of muscles, you never knew about! “In the beginning,...... there were sagging breasts, flabby tummy, loose? pelvic floor (lots of trips to the loo); no strength. “From my childhood to 30's, I played a lot of sport. Rugby League football for 25 years, cricket for 10, basketball for 5 & boxing for 5. My point being that I knocked myself around and probably did suffer long lasting injuries. Then, I suffered a ruptured disc at the base of my spine. I was in constant pain, whether I was sitting, standing, walking or sleeping. 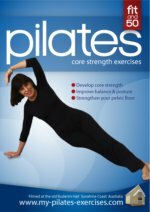 My orthopaedic specialist recommended Pilates with a programme that dealt with core strength & stretching. Then I found Pamela. I started Pilates, one day a week. After 3 months, I realised that it was doing me a lot of good, and therefore started a second session each week. I now do two one hour sessions each week. I have recommended pilates to all my friends and have told them about her pilates exercise videos.